Joe Gough (West Waterford AC) with his 800m and 1500m gold medals after an amazing week at the World Masters Athletics Championships in Malaga. Photo: James Veale. 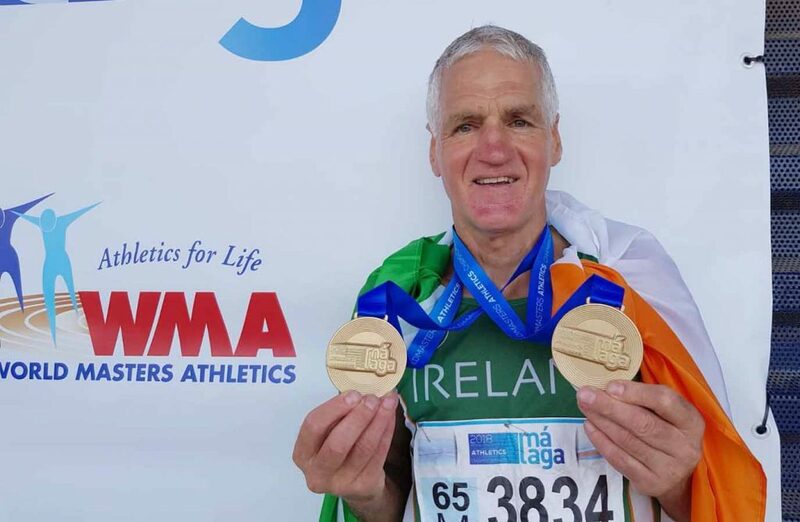 Like so many times in his Masters career that stretches back to the over 40 age group Joe Gough West Waterford AC was in top form at the World Masters Track and Field Championships in Malaga last week over 65 as he scored a spectacular double in the 800 and 1500metres. Joe’s busy week in Malaga began on Sunday week with the semi final of the 800 metres and in this he showed he was in fine shape as he easily won it in 2 minutes 28.11 seconds, automatically qualifying for the final on the Tuesday. In that final which he won decisively with a new European record time of 2.16. 38 seconds he was a class apart having over three seconds to spare over the second athlete home Michael Barrand Australia timed at 2.19.96 with Carlos Londono Colombia third in 2.21.30. He was back in action on Saturday last in his second choice event the 1500 metres semi final and again crossed the line first in 5.21.78 automatically qualifying for Sunday’s final. In his week in Malaga Joe was 100% perfect in his four races winning his semi finals and finals. He has been blessed in his his outstanding career in Masters athletics in every age group with first and foremost a terrifically positive outlook so essential going through life in everything someone does, great health and has been more or less injury free real or imaginary. No doubt his tremendous appetite for the sport will continue .Sports persons in any sport of every age group can learn from Joe, by always looking upwards and onwards, positivity breathes success. Joe has a total of five World Masters titles between outdoor and indoors and twelve Europeans again between outdoor and indoors mostly 800 metres but a few 1500 metres, all won in exceptional times for his age group at any stage. No doubt he will continue to excel at the sport he loves as long as he can.